HDFC Bank has renewed their list of 10x partners and kept the Jet Diners Black card out of their recent devaluation. In their attempt to keep the HDFC Bank Diners Club card holder happy, they added the international spend program in September last year, where one could get HDFC Diners 10X points for International Spend through December 31, 2017. This was extended till June 2018. Last quarter, HDFC Bank extended their 10x promotion to Smartbuy. This means you can get tonnes of more points to shop on Flipkart, Yatra and Cleartrip amongst other merchants. The bonus points earned here are over and above any spends made on other promotions such as the regular 10X promotion or the Smartbuy 10X promotion on all HDFC cards. As usual, the points come in within 90 days after the spend is done, and you need to pay in a foreign currency to be able to get your points. 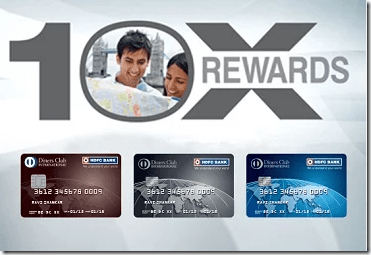 HDFC Bank Diners Rewardz: You earn 3 Reward Points/ INR 150 spent, which value at INR 0.90. With this promotion, you get another 27 Reward Points/INR 150 spent, so you get a total value of INR 9/INR 150 spent, which makes it 6% cashback in total. HDFC Bank Diners Premium / Club Miles: You earn 4 Reward Points/ INR 150 spent, which value at INR 2. With this promotion, you would get another 36 Reward Points/INR 150 spent, so you get a total value of INR 20/INR 150 spent, which makes it a 13% cashback in total. HDFC Bank Diners Black: You earn 5 Reward Points/ INR 150 spent, which value at INR 5. With this promotion, you would get another 45 Reward Points/INR 150 spent, so you get a total value of INR 50/INR 150 spent, which makes it a 33% cashback in total. HDFC Bank has also added the Diners Club Cards to their Global Value program. You pay INR 199 towards your welcome or renewal benefit from this promotion. In return, you get 500 Reward Points on activation by doing the first international transaction. Subsequently, you get 1% cashback up to INR 1000 per billing cycle. If you spend more than INR 150,000 per annum, you get an additional INR 2000 Yatra Voucher. You need to call HDFC Bank to enrol in this program and you get it activated within 5 working days. I’m glad that HDFC Bank continues to keep their top tier customers happy at least. So, if you are on an international trip, or spend abroad buying off Amazon, here is the place to direct some of your spends on. What are your thoughts on the promotion? Ajay, if I don’t book via the smart buy site am I still eligible for 10x on Yatra and other 10x partners. Also regarding your miles masterclass, is there anyway to have a webcast of it? Hey, I wanted to understand, that let’s say something is available in Amazon but I can’t find it in smart buy, what should I do to ensure that I get 10x on that purchase as well? Ajay, may be an insignificant math, but wouldn’t the “limit” for international spends be 30000 and not 33330? A forex spend of 30000 gives you 30000*50/150=10000 points. Or am I missing something basic? @Sandeep, because you are counting the basic 1X also in the 10X, you are getting 30K. Strip that away and count for 9X and you know what I am speaking about. The HDFC 10x page says that the points cap for Smartbuy and International spends is “per month” whereas the cap for partner brands is “per statement cycle”. Would it be correct to assume that Smartbuy and International spends should be maxed out per calendar month? I dont think diners club card work on amazon uk or us….i have tried once and it was declined. It does, it has worked on Amazon US every time I have tried.